Deuce delivers a closer look at Ford's seminal1932 model--the car that came to define 'hot rod' and brought speed and style to America's drivers. It's old, classic, and equipped with a behemoth engine modified for linear speed - everything a hot rod should be. They certainly don't make 'em like this anymore. We're talking about the car that launched the hot rod subculture: Ford's 1932 Deuce. With its stylish lines, timeless grille, and flowing fenders, Ford's Deuce coupe pretty much defines the term hot rod. The breadth of creativity this classic design has inspired for generations of hot rod builders is on full display in Deuce. Ford's '32 was an immediate hit. By 1931, the Model A was obsolete in a marketplace where drivers wanted more style and power. The design goals for the '32 Ford could be summarized as more: more cylinders, more horsepower, and more style. The resulting car achieved its objectives and then some. It was faster, more comfortable, more refined - a masterpiece of industrial design, yet still affordable. Henry Ford and his design team got it right. As the Deuce transitioned to the used car market, it drew the attention of those with a need for speed. Stripped down with an emphasis on performance, the Deuce became the bedrock of the burgeoning hot rod movement. To this day, it very much defines what a hot rod should look like. 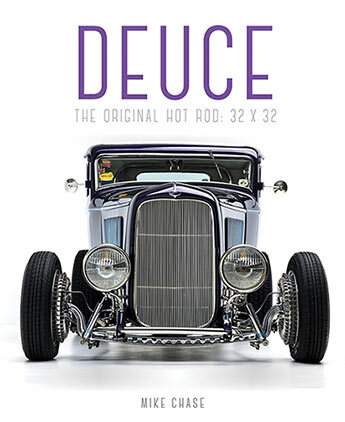 Hot rodders took Henry's master stroke to a whole other place, and Deuce stands as a tribute to their ongoing ingenuity. Mike Chase is a lifelong gearhead who has owned and built numerous hot rods and motorcycles. Photographing and writing about all things mechanical, he has published in top American hot rod and motorcycle magazines including Hot Rod, Rod and Custom, Street Rodder, Popular Hot Rodding, Custom and Classic Trucks, American Rodder, Easyriders, Hot Bike, and Cycle World, as well as magazines and books in England, France, Japan, Australia, Germany, and Italy. Mike has also contributed to a number of books on topics ranging from hot rods and motorcycles to World War II aircraft. He's a Northern California native.